This is your dream ride! 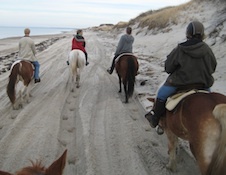 Miles and miles of open beach to enjoy horseback riding on Cape Cod. Take in scenic views from the top of the dunes, the scrub pine forest, natural cranberry bogs, and out on the beach. More experienced riders can wade with their horse at the ocean's edge, but any experience level including a novice can make this trip. All sorts of ride varieties are regularly requested, ranging from a romantic guided honeymoon ride for two walking side by side … all the way up to a blast with a pack of horse lovers running free! Note: scenic part first, then speedy parts start around 3:00 into the video. Here is the standard schedule, unless you arrange it differently: once the horses arrive at the Cape, we will stop at IHOP for a late breakfast (cost of breakfast is not included with the ride) before heading to Sandy Neck Beach in Barnstable. 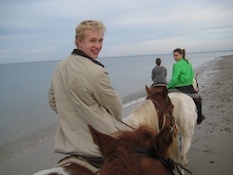 At the beach, we will mount the horses for a fun, exhilarating and relaxing ride. We will ride through the surf of the New England Coast, ride over the sandy dunes and across the 6 mile breadth of Sandy Neck Beach. Also see the CapeCast video about one day's ride on the beach. Our guides provide individualized attention as they lead the riders on what may very well be one of the most memorable days of their lives. At the end of the day following the ride, you are welcome to join us for a traditional New England Shore Dinner on the way back to Grafton (cost of dinner is not included with the ride). 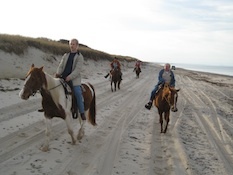 We start the 11-mile ride at the beach parking lot at Sandy Neck Beach onto the Access Trail, then we turn onto the Front Trail along the surf line. 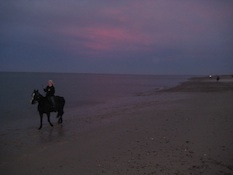 The horses are free to walk in the tranquil waters of the Upper Cape and run along the tide line. After a spell on the beach, we head to Braley's Dune Trail, (also known as the "Horse Trail") and make a circuit of the native vegetation including grasses, scrub pines and natural cranberry bogs. 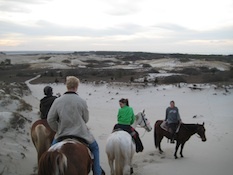 Breathtaking vistas unfold at each turn, and especially when the horses reach the top of the dunes (click for gallery). Cape Cod Rides typically require a few days advance notice — a week's notice is best. The event will take the whole day, unless individualized arrangements are made. Saddle time is 3 to 6 hours for one "lap" of the beach park, depending on how you want to pace the ride, stopping to explore the surf line and enjoy the sights. Weekday rides Monday through Friday are the simplest to arrange. Also please call well ahead to discuss the possibility of a weekend ride. To protect horses from exhaustion during the long ride in sand, the rider weight limit is 240 lb (110 kg). To find out more, please feel free to call us at +1 (508) 839-3038. Read the What To Wear page for clothing tips when riding. NOTE: From approximately June 1 to August 26 each summer, the Braley's Dune Trail is closed due to bird nesting season (piping plover and others). Call +1 (508) 839-3038 for the latest beach status or view the official status from the park's website. Ridge Valley Riding Stables, Inc.